The Masterpieces playing cards feature 56 custom cards printed on the classic Air-Cushion Finish. 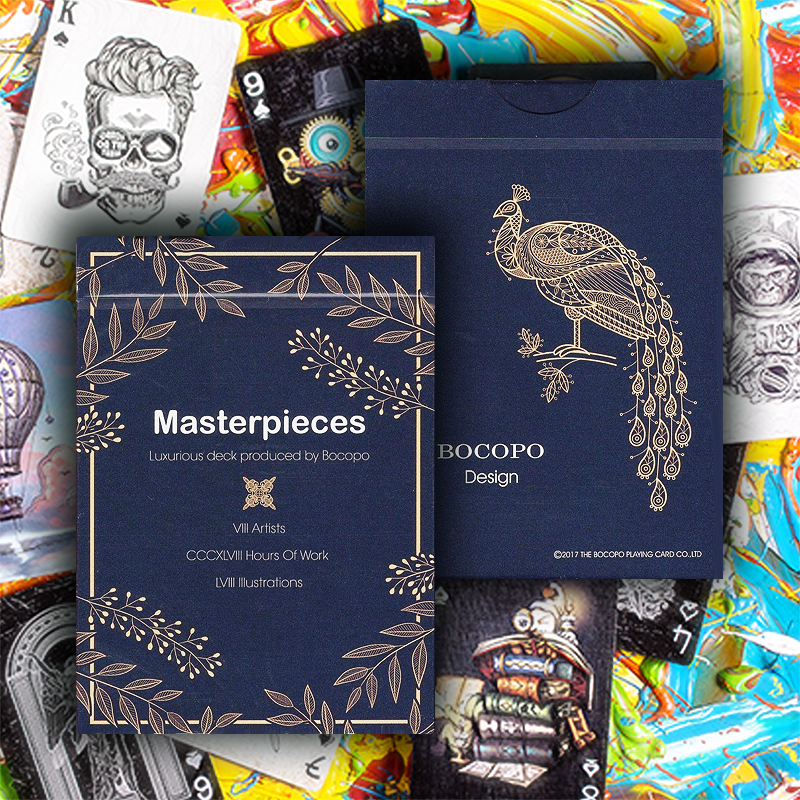 Released by Bocopo Playing Cards Company and printed by USPCC, these decks are guaranteed to mesmerize you! Tuck case is mainly the color of navy blue which gives a person a kind of low-key profound feeling. It is surrounded by two different branches all around and the two kinds of color have obvious contrast. The brand uses white color, which can have obvious show. The back of the Tuck case is showing a peacock, which stands on the branches quietly and coolly, and seems to be thinking. It gives a person a kind of mystery. The color of the peacock is golden yellow. The navy blue helps to throw up and show the peacock graphically. The Back cards are artistic, easy for Fanning and Cardistry Player. The spades Ace has a unique design on the structure. At the center of the faces, the drawing has the design of heart shape and the key colors of red and orange, which can give a person the feeling of full of enthusiasm. The center of heart shape is filled in English letter LOVE. The overall design is full of LOVE, connected by soft lines all around. The soft feeling is doubled. Design by SI SCOTT in UK. Each face card has a different pattern, and each one represents a different story. The content design of the faces is very vivid, and each image looks like the fresh life. Art of works playing cards, drawn by SI SCOTT in UK.